The exhibition Illusionismo Surreale. Fantasie fotografiche del primo Novecento in Europa (Surreal Illusionism. Photographic Fantasies of the Early 20th Century In Europe) features some 300 photographic postcards that boast an amazing wealth of pictorial ideas, artistic quality and photographic allure. Surreal fantasies, mysterious dreams, role-play, glamorous divas and irony are running galore in the postcards on display. They transport the viewer into a fascinating yet largely forgotten era of “industrial photography”. At the same time new vistas are opened to the early history of modern photographic art. The late 1890s saw the emergence of a number of factories in Europe that were set on creating a new form of popular art. Photographs were not printed on the cards, like today, but instead real photographs were produced by using mechanised exposure and development processes. Ca. 95% of the cards exhibited consists of real photographs, mainly hand-coloured silver bromide prints. The exhibition presents stunning samples created by the leading European photographic companies. The most popular cards were made in Germany and France, but the exhibition also features some Italian and American samples. The Italian companies represented are Alterocca Terni and Fotocelere. Between 1900 and 1914, the production of photographic postcards, also known as “real photo postcards”, became an important European industry, and the end products were distributed as far away as South America and Australia. The phenomenon only lasted for two decades, but it resulted in millions of photographs. Today, these cards are coveted collector’s items. 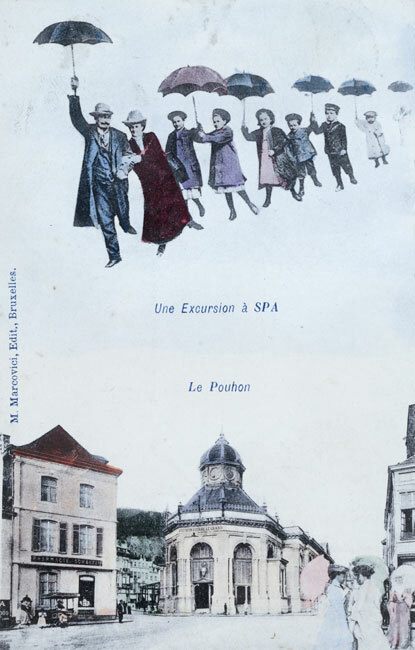 From today’s perspective, photographic postcards are fascinating particularly because of the photomontage techniques used. 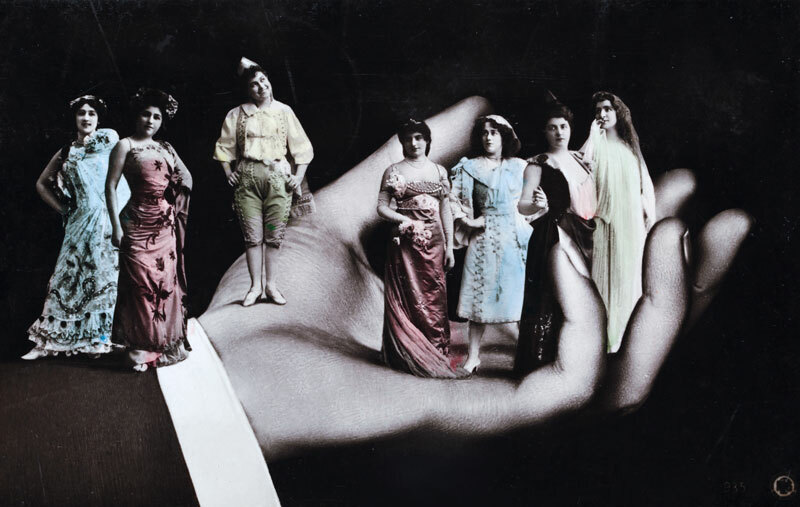 The combination of photography and decorative design, collage, montage and multiple exposures were some of the methods applied over a hundred years before “photoshopping”. Because colour photography was not yet applied, the images were coloured by hand. This craft finish gives these mass-produced photographs a unique touch, while the synthetic colour effects further enhance the sense of mystique and fantasy. The golden age of photographic postcards drew on the urban popular culture that emerged in the early 20th century. The rise of the cinema, the modern culture of sun-bathing, circus, erotica and variety shows inspired the imagery of the cards. Technical innovations, such as the aeroplane, stimulated the imagination. With the advent of the First World War the golden age of postcards began to wane. The aesthetic innovations, however, lingered on. Artistic ideas such as synthetic cubism and collage were based on techniques that were used extensively in postcards at the very start of the 20th century. In the 1920s and 1930s, a group of avant-garde artists and poets began to draw inspiration from dreams, fantasy and the depths of the unconscious. An art movement known as surrealism emerged. 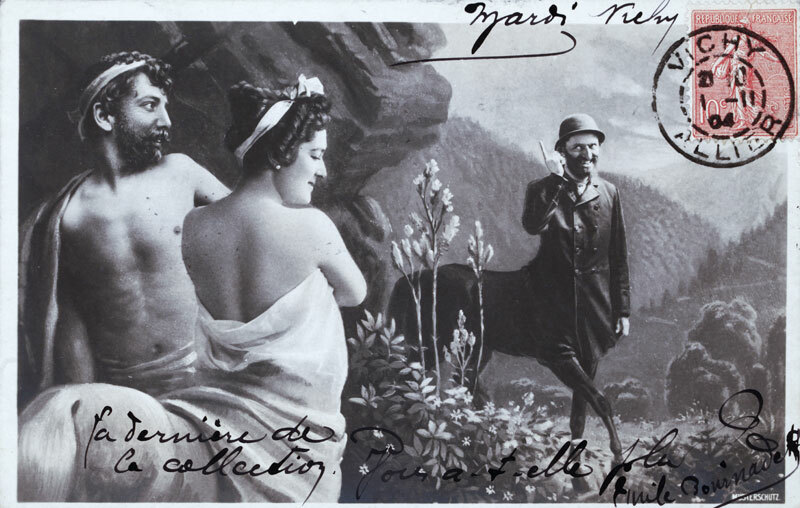 The photographic postcards presented at this exhibition were “surrealist” before the word was even invented!